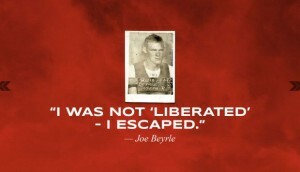 Joseph Beyrle is the only American soldier ever to fight for the United States Army and the Russian Red Army. Joe completed this feat in World War 2 where he was a paratrooper who was captured and taken to various prison camps, all of which he was able to escape from. He then found himself in Russia convincing the Red Army to allow him to fight with them back into Germany and eventually get home. Joe was born on August 25, 1923 in Muskegon, Michigan along the sandy beaches of Lake Michigan in 1923. Joe had a large family, with 7 siblings. His grandparents were direct immigrants from south Bavaria in Germany and because of this, German and English were used in a mix at home and this dual exposure, consequentially created issues for Joe when going through school because his English was not very strong (5). The Beyrle family was very much like the rest of the United States in the late 1920’s and early 1930’s, struggling to make enough money to make ends meet with the stock market crash. Joe was a very skilled and gifted athlete when growing up and in high school and was offered the opportunity to continue his schooling and athletic career by Notre Dame University to play baseball. However, Joe turned down the scholarship opportunity to volunteer to join the United States Army after he graduated high school with the attack on Pearl Harbor by the Japanese coming just 6 months before graduation. Joe decided to join the army because war seemed imminent as Pearl Harbor was just attacked and the United States was tied into World War 2. Joe was a paratrooper for the 506th Parachute Infantry of the 101st Airborne Division and when training to become a paratrooper, Joe earned the nickname of “Jumpin Joe” (3). Since Joe was such an outstanding athlete, Joe would take the place of other paratroopers in training and pretend to be them and do the practice jump for them, “A lot of the guys were afraid they would sprain an ankle of break a shin bone before a mission…as they got closer to the jump, they would actually give him dollars to show up and make their jump in their name” (1). The 506th was one of the best infantries in the US Army because of what amenities were at this camp, “Since the camp didn’t have a rifle range, trainees had to march thirty miles to Clemson University in South Carolina for shooting practice” (2) and had to endure running up and down Currahee mountain that was nearby which is 1.5 miles up 1.5 miles down. They were known for being “First In! Last Out!” (9). After his training had been completed, Joe and the rest his infantry were shipped to England, a year after he had joined the army, where they were being tasked with invading Nazi controlled France in Operation Overlord. In April of 1944, “being maybe the best parachutist in the 101st airborne division, they asked him to volunteer to jump …to carry gold to the French resistance there, he did this twice with what would be about a quarter of a million dollars’ worth of gold strapped to his body [approximately 500 lbs of additional weight! ]” (4). He jumped into hostile territory to meet up with the French Underground, with 2 other men from the 506th who he did not know to deliver this gold to them. After meeting with the French, he was constantly moving for over a week, all so he can get to a safe location so a plane at night can get them and bring them back to England, all to repeat the process again just a month later. On the night of June 5th, the invasion of Normandy was a go. “We flew approximately ninety minutes from England when we hit the Normandy Peninsula. We started taking AA and ground fire, flying at approximately 700 feet. Several planes were hit and exploded or crashed. We got the stand-up and hook-up, redlight, greenlight, and jumped at 400 feet and I landed on the church roof at Saint-Come-Du-Mont, taking fire from church steeple, slid down and made my way through a cemetery surrounding a church, over a wall and headed toward our objective, which was two wooden bridges over the Douave River behind Utah Beach. The Germans had torched a house in the area where I jumped and were firing at the planes that followed us. Tracer bullets were criss-crossing the sky. Many troopers were hit before landing” (5). Para trooping was no easy task as “American paratroopers… landed ‘in pastures, plowed fields… anti-glider poles, in tall trees and small trees… on rooftops’…looking up to check his parachute and watching as enemy bullets ripped through it” (10). He was able jump down from the church and escape the Germans shooting at him by running through a cemetery. His objective was to head to two wooden bridges behind Utah Beach that were giving access to the beach to the Germans. All the casualties of other paratroopers and planes being shot down, meant Joe was with a much smaller group of troops, and while he was separated from the group, was able to blow up a nearby power station in Ste. Come Du Mont. During the same time as the paratroopers were being deployed, there were troops also storming the beaches of Normandy creating an amphibious attack on line where the Germans were trying to hold. This constant and relentless pressure being applied to the beach is what caused them to win this location for the Allies. It was when he was working his way toward the bridges, that he was captured by some German troops when he “crawled over a hedgerow and stumbled into a Nazi machine gun nest” (7). He gave up his name, his rank, and his serial per Geneva Convention requirements and was taken in as a prisoner of war. The Germans then took his dog tags and because Joe had a German last name of Beyrle, they gave the tags to a German spy who was trying to cross lines into the allied forces territory, but ended up not making it (5). Now because the tags were present, this led the United States Army to believe that Joe was dead, and they notified his family that he was killed in action, even though he was still alive and in a POW camp. Joe was never treated fairly in the prisoner of war camps, and was consistently tortured and beaten in every camp by the Nazis, as well as the Gestapo, which is the secret police force that aided the Nazis in elimination of opposing ideas to what the Nazis thought. Joe’s daughter was interviewed and was asked if there was much said about the prisoner of war camps or anything really about what it meant to be captured and what they did to you. She responded with “He had a dent in his head, it was very visible, I remember putting my finger in it” and she remembers asking him about that dent in his head. She said that he replied with “a German got mad at me” (3). Joe was never one to give up and was always looking for a way to escape, and after being outside of the camp on work detail, took off running. But the dogs they had were much faster and could smell us and they were quickly caught. After getting caught again, was where the real negative treatment started. Joe was then “progressively taken eastward towards the eastern front, he had already made two unsuccessful escapes since he’d unsuccessfully tried to get to the allied lines to the west” (4). They were forced to march from one side of Nazi controlled territory to the other by 8-10 hours a day of marching. They were given very little food and water, couldn’t shower, and had to sleep on straw on the ground as a bed between camps. When they got to the camps, they were berated with questions about the army and what their plans were while being tortured. Joe soon realized that he needed to escape these POW camps, so he began to devise a plan to get out. Cigarettes became a valuable resource in the camps and Joe was able to bribe one of the German guards with them to cut some of the wire in which he was able to slide through and jump on a train at the nearby train station at night. The only problem was he thought the train was going to Poland, but instead it was going to Berlin. The Gestapo was brutal to the escaped prisoners of war, “We were interrogated, tortured kicked, knocked around, walked on, hung up by our arms backwards, hit with whips, clubs, and rifle butts” (6) and this went on for days. Strangely enough, it was the German army that saved them as they reclaimed the three men as prisoners of war in their camp. The will in Joe kept him unsatisfied as he devised another plan to head directly west after hearing news of how the Russians were closing in quickly. They were able to sneak out of the compound in the empty food containers, but when they were tipped over on the way out of the camp, “We took off and run through the scrub pines and then the guard opened up and the two guys who escaped with me were killed and I made it to the stream and I went downstream because they turned the dogs loose at that time” (1). Joe was able to keep moving west and eventually, found the Red Army. After escaping the prisoner of war camp and finally reaching the Red Army, Joe yelled to the approaching tank unit “Amerikansky tovarishch” where he begged and pleaded to let them allow him to fight alongside them, “I told him I was an American escaped prisoner of war, and I wanted to go with them and defeat Hitler, and he says ‘No,’ that I couldn’t do it,” Beyrle recalled in the interview. “Then the battalion commander came up and he explained to her … and she says, ‘Da, da’ (Yes, yes)” (1). They had allowed Joe to fight alongside them for about one month (11) time and soon Joe was going right back in the direction he had just came from, but this time he had a Soviet Union tank unit with him at his side. It wasn’t long until we were able to free the POW camp I was in and continue moving on with the Red Army tanks. However, they were quickly ambushed, and Joe was injured in his leg badly. This is when he met Marshal Zhukov, a Russian officer. Marshal asked how he was doing and asked if there was any way he could help. Joe replied with how he had lost all his identification to prove he was an American. 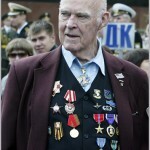 He later recalls “The next day the [Russian] interpreter came back and handed me an envelope, a letter all in Russian. ‘You don’t need to know what it says, that’ll get you any place you want to go” (2). Joe was able to make his way to the United States Embassy in Moscow and eventually back home in Michigan. Beyrle was able to revisit Russia later in his life after his son Jon became the United States Ambassador to Russia. “My father first came back here 20 years after D-Day,” said John, who himself served as a U.S. ambassador to Russia. “He really wanted to see, in the daytime, where he had landed in the middle of the night. Here he met with veterans of his unit from which he was separated and never reunited. After that, he came back every five years on the anniversary of D-Day, until his death in 2004” (1). Joes time spent while in the Army and the miraculous things he was able to do, earned him lots of various medals and the most notable included a Purple Heart from Bill Clinton and President Boris Yeltsin of Russia gave Joe the Soviet Medal for the Liberation of Warsaw, Victory over Germany, and as well as the Soviet Order of the Patriotic War. There is now a dedicated exhibit in the Lakeshore Museum in Muskegon as well as a plaque in his name in “Saint-Come-Du-Mont where he first landed on D-Day on the church” (8). 1. Riedel, Alexander. “D-Day Vets Remember ‘Jumpin’ Joe’ Beyrle.” army.mil. 3. Champion, Brandon. “Muskegon World War II Hero Joe Beyrle’s Children Talk ‘Dent in His Head,’ Female Commanders.” com. 4. Simon, Scott. “Paratrooper Joe Beyrle, a Soldier for Two Armies.” org. 5. 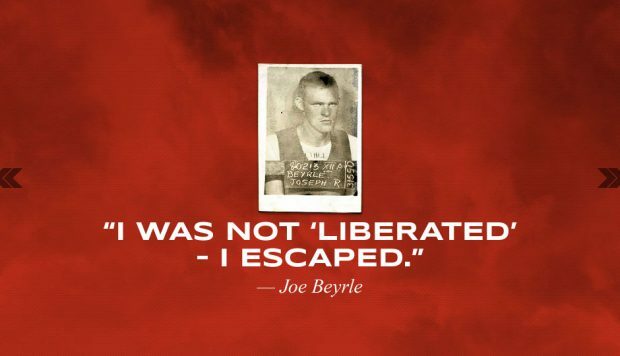 “The Chronicle of Joe Beyrle: An American in the Red Army.” Honor and Fidelity.